Add oil to a heated pan, stir Mindful Chili Sauce in oil, tomatoes until it sizzles. Add potatoes, yellow pepper, and egg plant and stir evenly. When it’s half done, add kale and allow everything to come together with the lid on. Wonderful with rice and lentils. 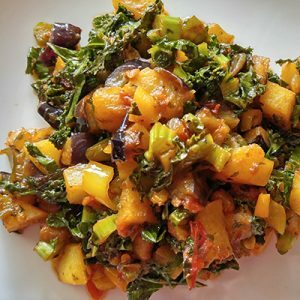 brenpa's kitchen, eggplants, kale, Mindful Chili Sauce, mindfulness, peppers, Recipes, vegetarian. Bookmark.